Under the grubby soils of northern Colorado lies the nation’s biggest diamond deposit. Its crystalline bounty was almost found by accident. In the late 1960s, Colorado State University geologists were studying some rather unusual, crumbly rocks northwest of Ft. Collins. These drab-green exposures were notable because burrowing animals liked to tunnel through them and because only certain types of trees and bushes thrived atop them. The rocks also contained a variety of “indicator” minerals that tend to form under high temperature, high-pressure conditions that prevail deep in the earth. The geologists mapped the distribution of these rocks and found they originally formed in a series of funnel-shaped volcanic pipes. The worn-down tops of the “kimberlite” pipes—named after Kimberly, South Africa, where they are abundant—are visible from outer space. They extend from southern Wyoming all the way down to the People’s Republic of Boulder. A decade or so after their discovery, a student was grinding down samples of these rocks so they could be examined under the microscope. They made an astounding observation. Rather than the rocks being ground down by the polishing grits and plate, the rocks were etching grooves into the polishing plate. The likely culprit? The hardest mineral in the world. Analysis of the wafer-thin rock samples by the professor down the hall provided confirmation. Diamonds! Such diamonds are birthed a hundred miles beneath North America, as extremely high-pressure conditions force carbon atoms to glue together in nearly indestructible honeycomb-like networks. Such crystals are incredibly rigid, resistant to breakage and brought to Earth’s surface by the deepest of volcanoes. These minerals formed hundreds of millions to billions of years ago when North America was a wee youngster. Thus, they tell us about what Earth was like long before forests towered or dinosaurs lumbered. Most of Colorado’s diamonds don’t look anything like those that a jeweler might facet. Rather, they’re small crystals that have holes like Swiss cheese or that have diverse shapes like triangles, cubes, and 12-sided dodecahedrons. They come in a rainbow of unusual colors including purple and lime green, and often contain microscopic blebs of liquid or other unknown gunk. These oddball crystals have recently become a treasure trove of untold scientific information. For example, new analytical techniques allow us to identify the gunk inside these crystals and use its chemistry to understand how our planet evolved. Scientists, myself included, have been leveraging museum collections of these diamonds to understand how our continents and major mountain ranges formed and even to learn where our planet’s water came from (it comes from rocks, not comets). Susie Moss and James Hagadorn look at Colorado fancy diamonds, shown above. By knowing how and where diamonds like these are formed, we can better predict where future diamond deposits may be found. Some of them might bear incredible beauties. Like the 16-carat yellow diamond found in Colorado’s kimberlites, which was the largest cut diamond ever from an American mine. No doubt there are more in the ground—both here and in Wyoming—just waiting to be discovered. Though most people think of diamonds as being used in engagement rings, they also have important industrial uses as abrasives and in cutting or grinding applications. Industrial diamonds are typically tiny and are straightforward to synthesize in the lab. As a result, most of the world’s diamonds are not on rings but are synthetic diamonds embedded in drill bits, used as polishing powders, or lining the edge of saw blades. 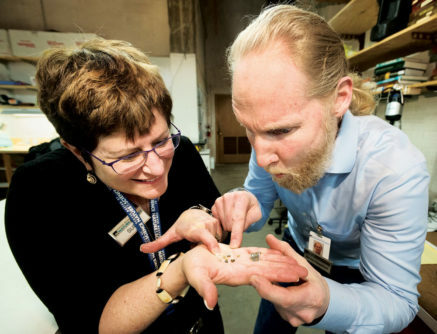 If you don’t have time to hike out to Colorado’s kimberlite deposits to see tiny diamonds in person, check your garage—you probably have your very own mini-industrial “diamond” collection!